A standalone Flight HA1710 story set in a series of books based around an event. Co-Pilot Lachlan Donaghue wakes up in hospital, a survivor of the crash of Flight HA1710, with memory loss and the suspicion that he could be at fault for the tragic accident. When everything becomes too much he is taken home to hide, back to the small Irish town he grew up in and to the home he once shared with Rory. Rory Kendrick watches the news, sees every hour of the disaster unfold and somehow just knows that Lachlan was in the middle of it all. What he doesn’t know is that Lachlan will be forced to come back home to hide and to heal. Lachlan needs a friend, not a lover, but sometimes the lines are just too blurred to make any sense. I was watching something on the TV, I don't even know what, but I recall turning to hubby and saying I wanted to write a book about what happened after a plane crash, how it impacted the lives of people who were involved, or who observed. Then I had the inspiration of asking other authors to write a story in the same vein, all based around characters impacted by a plane crash in Ireland and Flight HA1710 was born. My book is entitled Retrograde. It is published 12 June and is the first of the six books with the others following weekly from their own presses, by Amber Kell, Sara York, Serena Yates, Clare London and Meredith Russell. These are stories based around the crash, the man who missed the plane, the steward, the investigator, and just how one incident can change so many lives. 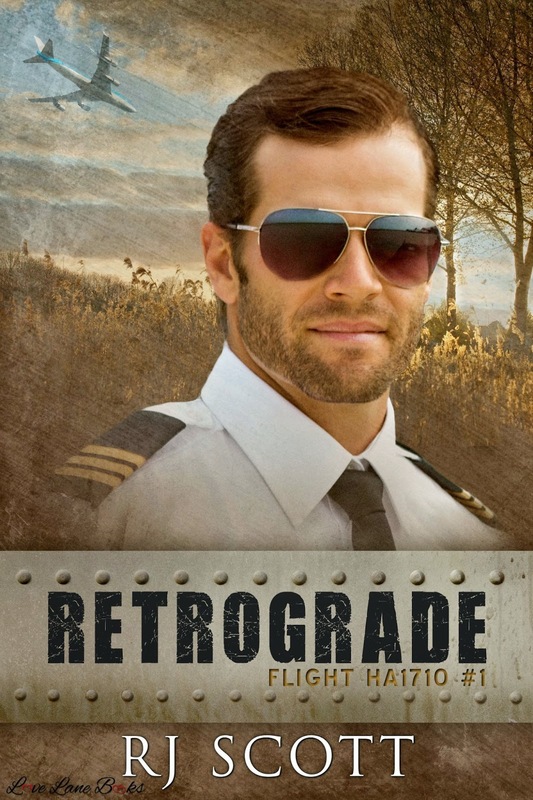 Multitaskingmommas Book Reviews - 5/5 - "....I have to say, Retrograde has got to be about the best read I ever read from author RJ Scott. She is usually an author who comes up with the most amazing stories but all of them, at least those that I had read, were sweet romances that made me smile goofy all the time. They were light hearted, they were fast reads, and even if the characters met some angst and frustrations along the way, they never made me feel uncomfortable enough to DNF or fast forward. With Retrograde, it was enough to make me pause and go to the author page once more, just to make sure I did not misread the author name. This was way better than good...."
....You will love this book friends, the connection between these two men is evident, even as they struggle with if they should act on it again or not! Thank you Rj, for a perfect book 1 in a series that promises to be wonderful!...." Padme's Library - 4.5/5 - "...Another great turnout by Miss Scott with characters you want to know, even the airline liaison you want to knock down a few pegs, and a love that you know will be rekindled, and a story you can't wait to see just how it all plays out." Rainbow Book Reviews - 4/5 - "....This is a very intense, emotional love story about two men forced to confront their past demons, admit their mistakes, and move on with their lives. It's beautifully written, with passion and understanding, and most of all, it has a message reminding us that dwelling in the past, blaming each other or ourselves for events that have happened, is totally counterproductive and damages everyone involved. R.J., thanks for the heartwarming story. I am looking forward to reading the other five stories included in the ‘Flight HA1710’ series...."
Prism Book Alliance - 5/5 - "....I’m a bit of an angst fan and the whole premise of the Flight HA1710 stories appealed to me. Retrograde was a perfect jumping off point...."
Lachlan Donaghue opened his eyes, cracked them just a little. Something had sideswiped him, glass in his hair, his hands gripping… to his left a person, eyes wide and open, facing Lachlan with not a spark of life left. And red… orange. And silence. Utter and complete silence. When he opened them again, this time there was no red, only the blur of a night sky, the black all encompassing. This time there was noise in the silence. A shout, crashes and bangs, and a sense of urgency in the people who stared at him now. It hurt too much to keep his eyes open. Tell Rory I’m okay. Don’t let him worry. Who cares? I can't even speak, let alone think. Lachlan answered… or at least in his head he answered, but his throat was tight, there was pain in his head and neck, and he was staring at whiteness and blinking at bright lights. Where had the red gone? And the black? Rory, I’m sorry. I should have told you I was sorry. The TV was loud, discordant, and scary with red and orange against black, and they were shouting at him from the screen. People walked around him, all the time talking about the TV—or was that the TV itself? Nothing made sense. “The Captain is dead.” The words spun in his head, people talking around him; a chaos of noise. “Not… Andrew.” Lachlan murmured in despair. The staring eyes, the absolute stillness and quiet—Andrew was dead. Is everyone dead? Am I dead? What kind of hell was he in where they pushed him and held him, then took the pain away with needles? The words faded, and he looked past the man who stared at him, looking instead at the screen, hearing the words all pilots dreaded to hear. Death. Destruction. Crash. His picture flashed on the screen labeled in yellow: Lachlan Donaghue, First Officer. Then there were safety records… and red … and orange. “And do you think, taking this into consideration, that the crash was deliberate? An act of terrorism? Or one of the pilots deliberately flying the plane into the ground?” A soft but insistent voice came from the TV. Sounds great - looking forward to it!